In this image, we can see that the north pole is surrounded by a vast “sea” of basaltic sand dunes. In northern winter a seasonal polar cap composed of carbon dioxide ice (dry ice) forms and the surrounding dunes become covered with frost. In the spring, the ice sublimates (evaporates directly from ice to gas) loosening and moving tiny dust particles. The bright portions of the dunes in this image are areas still covered with seasonal frost while dark spots are areas where the frost is gone or dark dust has cascaded down the sides of the dune. 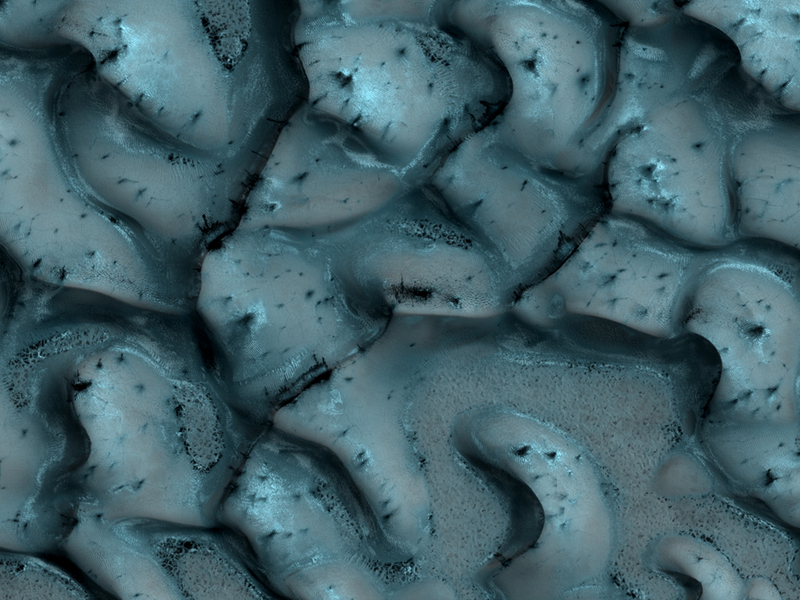 The dunes imaged here are similar to barchan dunes that are commonly found in desert regions on Earth. Barchan dunes are generally crescent-shaped with a steep slip face bordered by horns oriented in the downwind direction. Barchan dunes form by winds blowing mainly in one direction and thus are good indicators of the dominant wind direction when the dunes formed.